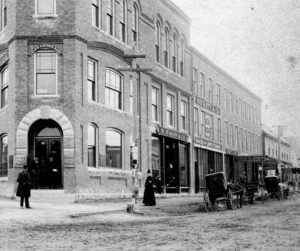 Remember in ancient times when you actually went to local merchant like Gordon Lord’s Downeast Electronics or Olsson’s Sears outlet and bought your first microwave or spent three months pay on one of those early video cameras with cables and the side bag for carrying the recorder. You may have also foolishly walked out with a very soon to be obsolete 8 track player for your car or even worse a Beta format video player. Gordon was quite happy to take in exchange for all these treasures a handful of dirty thin green paper even when it was scribbled on, discolored, torn or taped together. Canadians, of course, had more colorful bits of paper but it was never worth quite as much as American green and they were at a further disadvantage as electronic stuff was much bigger and heavier in those days and difficult to get under the front seat of a car. 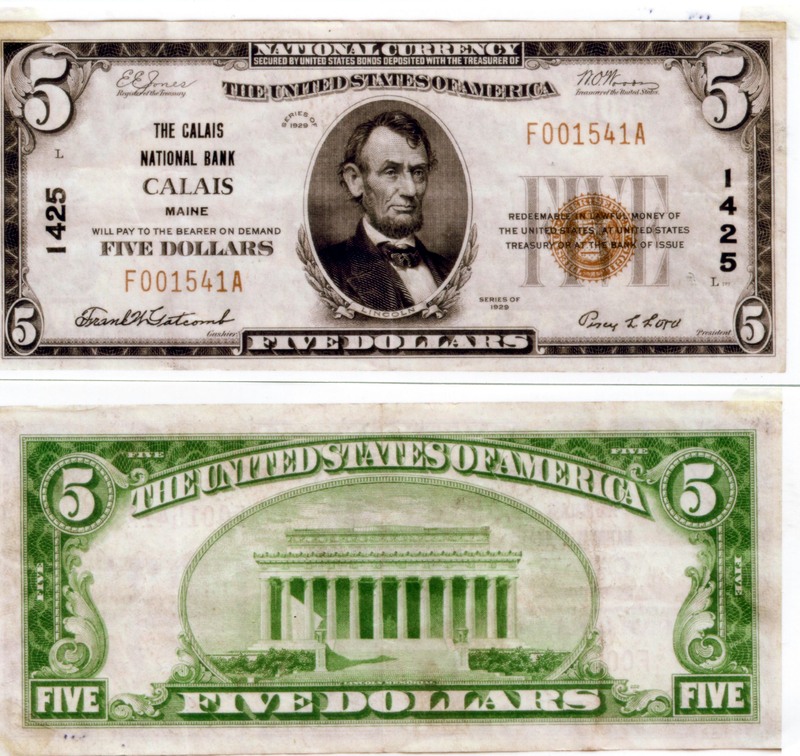 Those rectangular pieces of paper were called money and the government claimed the holder of these bills could redeem them at the U.S. Treasury, in the case of the bill above for $20 in gold coins although the government later decided this promise was unnecessary and began operating on the premise of “Just Trust Us”. Even before paper money people used gold and silver coins like the Spanish doubloon pictured above. One of the very serious drawbacks of both paper money and coins was the real possibility some less than honest citizen would print their very own paper money which looked like the bills issued by the government- known as counterfeiting- or manufacture coins which looked real but contained very little gold and silver- known as coining. Ebenezer Ball, the Robbinston man hanging from the gallows above, was a “coiner” and Moneymaker Lake in Robbinston is named after Ebenezer which we’re sure is of little consolation to him. In the early 1800’s business transactions Downeast were conducted in coins like the 1798 Spanish doubloon pictured above and there a severe shortage of such coins. Ebenezer was engaged in rectifying this shortage at Moneymaker Lake by dipping pewter coins in a dish of molten gold and then stamping them with the imprint of the Spanish king when he was discovered by Sam Jones, a local surveyor. Ebenezer Ball lived in Robbinston on the road to Calais very near what is now Brook’s Garage. 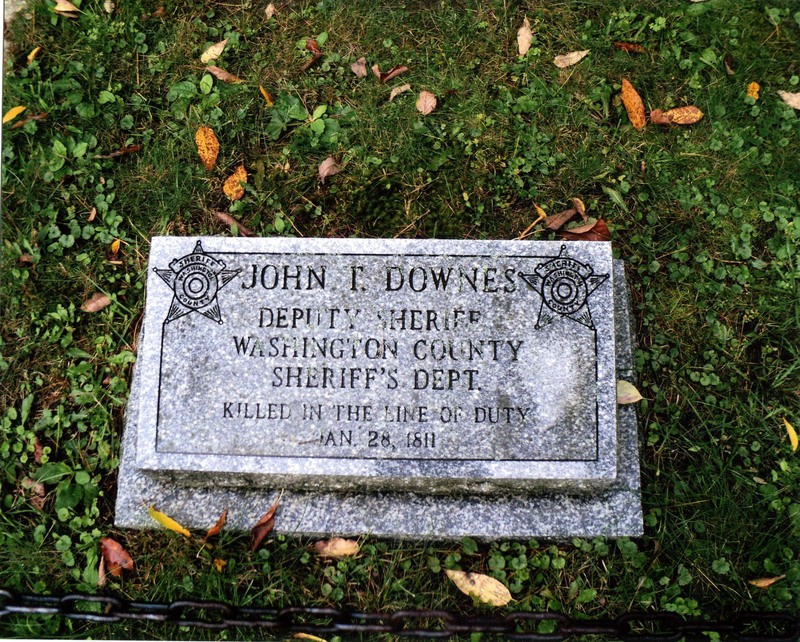 The authorities, based on Jones statement, deputized John Downes of Calais to arrest Ebenezer and on January 28, 1811 Downes and several other deputies proceeded from the Mansion House in Robbinston to Ebenezer Ball’s home to execute the arrest warrant. What then ensued is subject to much debate but the end result was the discharge of Ball’s musket which wounded Deputy Downes who died two days later in a bed at the Mansion House where he was carried after being shot. He is buried in the small cemetery at the Kirk McColl Church in St Stephen as there was no cemetery in Calais at the time. 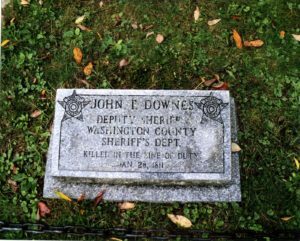 The original stone was lost or destroyed and replaced by the one above courtesy of the Washington County Sheriff’s Department. 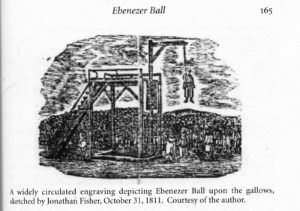 Ebenezer Ball was hanged at Castine later that year, the first person hanged in the District of Maine, another distinction he would have happily done without. 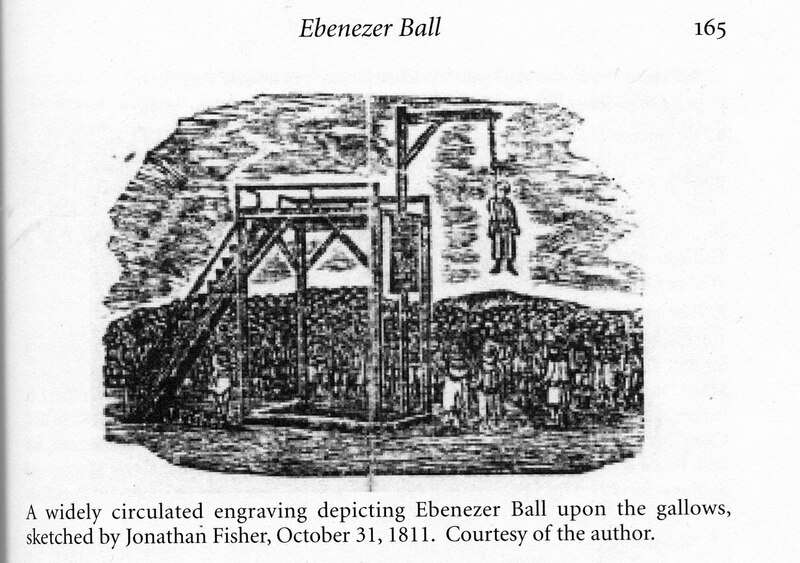 If there is any lesson to be learned from Ebenezer’s fate it is that the authorities take coining and counterfeiting very seriously, only the government can print money and any private citizen who is under the misapprehension that he has a “license to print money” is likely to pay dearly although probably not as dearly as Ebenezer Ball. The government was determined to make an example of Ebenezer and did not let either the evidence or lack of due process to stand in their way. All of which makes the 1931 five dollar bill pictured above very interesting because two locals men are responsible for this bill. Unlike what we have come to accept as legal currency this bill is not issued by the government, rather it is issued by the Calais National Bank which promises to pay the bearer Five Dollars although during the Depression there was no guarantee any bank had 5 cents in assets. It is signed not by the Treasurer of the United States but by the cashier of the Calais National Bank, Frank Gatcomb and the Treasurer of the bank Percy Lord. Who were these fellows with seemingly a “license to print money”? Percy and Frank were Calais businessmen who also happened to be officers of the Calais National Bank. Percy Lord owned the drug store just up the street from the bank and was for many years its treasurer. In the photo his drug store is to the right of Beckett and Company. Frank Gatcomb was the chief cashier of the bank. Like most banks in the country during the Depression years the Calais National Bank was on the ropes and did not have the funds to pay depositors because, as in days of Ebenezer Ball, there was a great shortage of money, in this case paper money as the federal government wasn’t printing any. In desperation the feds gave local banks the right to issue currency in order to increase the money supply and hopefully grease the wheels of the economy. Theoretically the local “money” was backed by assets deposited with the Treasury of the United States- says so just above Abe’s head on the bill- although we wouldn’t take the truth of that statement to the bank. And there is this- how much confidence can you have in a five dollar bill issued under the authority of a friend or acquaintance who maybe can’t beat you at bowling or cribbage? 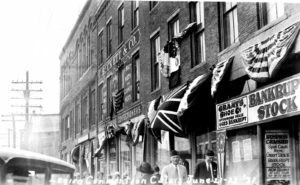 Would businesses in town accept the bill or in Machias, Bangor? It seems unlikely. In the end it was to no avail. 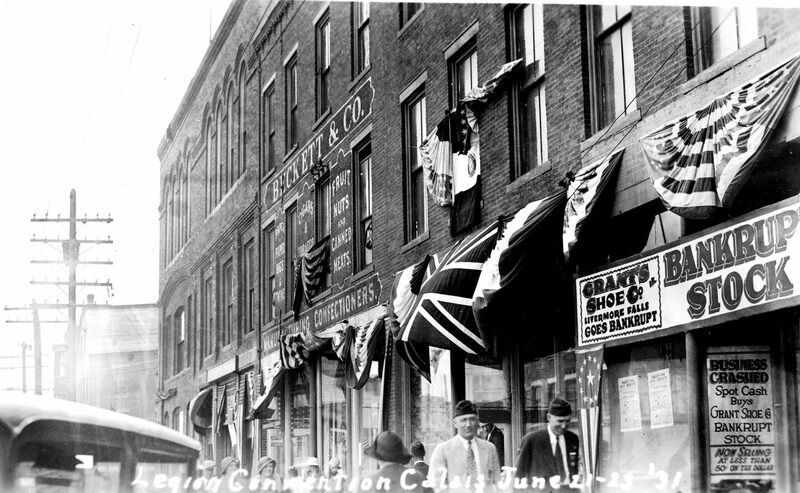 By May of 1933 the Calais National Bank was in receivership and many Calais businesses went bankrupt including the shoe store in the photo above next door to Percy Lord drug store. Other businesses soon followed. The bank struggled on in receivership for many years until the Merrill Trust bought it in 1945. Frank Gatcomb was named its manager but as far as we know never again had his name on a five dollar bill.